p. 17-32 : ; 24 cm. Atlanta, Ga: 504 Post Office Building. Dallas, Tex. : Chamnler of Commerce Building. Houston, Tex. : Chainler of Commerce Building. Jacksonville. Fla.: Chamber of Commerce Building. Kansas City, Mno. : 10U2S Baltimore Avenue. Memphis, Tenu. : 229 Federal Building. Miine:ilpplils, Minn.: 213 Federal Building. Seattle, Wash.: 809 Federal Building. and it hereby is approved in the name of the President. Division A dm ,( n ;.' frator. and hardware stores located in these rural trade areas. gency crop failures constitute peak periods. yearly as a result of the application of the Code to the trade. is not classified by me as a major indu.try. been deprived of the right to be heard prior to approval of said Code. For these reasons, this Code has been approved by me. raising, or any other agricultural pursuit. will assure permanency of business relationship. section (a) of this Article II. whom any such employee is compensated or employed. Industrial Recovery under Title I of said Act. shall mean an employee under eighteen (18) years of age. experience in the retail trade. tion, or through individual membership. ciations hereinbefore or hereinafter referred to. 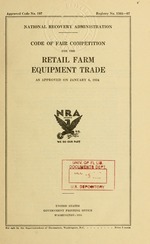 associations shall not be requisite for the purchase of farm equipment. reasonable share of the expenses of its creation and administration. factors as may be deemed equitable to be taken into consideration. taken by the said Central Code Authority. managing director of its own divi.sin. be accorded representation on the Central Code Authority. lowing schedules of hours of labor. than six (6) days per week. day, nor more than six (6) days per week. schedule of fewest operating hours. nor more than six (6) days per week. such election showing its store hours and employee working hours. it has elected to operate except upon December 31 of any year. Group in which it originally elected to operate. the weekly wage of its employees shall not on that account be reduced. additional six (6) hours per week. may work in excess of such maximum periods. work may be without the payment of overtime. :'t the regular daily rate of pay. every eight (S) workers above twenty (20). not be deducted from such employee's working tuie. included within the maximum hours permitted each week. for a forty-eight (48) hour work week. of $14.00 per week for a forty-eight (48) hour workweek. $13.00 per week for a forty-eight (48) hour workweek. no employee shall be paid less than at the rate of $10.00 per week. which is attached hereto and made a part hereof as Schedule A.
which they are employed has elected to operate. upon the basis. of a forty (40) hour workweek. such wages and for such hours as shall be stated in the certificate. (10) employees above twenty (20). require an increase in wages to more than the rate of $9.00 per week. in the foregoing sections of this Article. in the number of working hours of such employees. or prescribed by the Administrator. b) for one day per week, such day not to exceed eight (8) hours. '7 p.m. and shall not conflict with the employee's hours of day school. employees, full copies of this Code. of Articles V and VI and Sections 2 and 4 of this Article VII. under Section (d) of this Article. ity to mislead customers or prospective customers. contractual relations with such manufacturer. said effective date being January 19. 1934.
year after it was traded in may be sold without restriction. inconsistent with any provision of the Act or of this Code. joint and harmonious action on all matters of common interest. be subject to the penalties provided by law. imposed by him upon his approval thereof. order, approval, rule or regulation heretofore issued under title I of said act. with the requirements which would be otherwise obligatory upon them. or in conflict with the policy of the National Industrial Recovery Act.